When your organization was signed up to use Dentrix Ascend, Henry Schein One entered basic information about each location, which you can update as needed. On the Settings menu, under Location, click (or tap) Location Information. The Location Information page opens. On the Basic Info tab of a location's Location Information page, update the location name, logo, contact information, fee schedule, sales tax, and/or timezone as needed. Location name - The name of your location as you want it to appear on account statements and other correspondence sent to your office by Henry Schein One, billing statements sent to patients, and claims. Location logo - A logo for this location. This logo will appear online if you are using the online booking feature. To attach a logo, click (or tap) Select Image, browse for and select the image file, crop the image as desired, and then click (or tap) Apply. Address - The street address, city, state, and ZIP Code of your location as you want them to appear on billing statements sent to patients and on claims (box 56). Henry Schein One may use this to contact your office. Phone number - The main contact phone number of your location. Henry Schein One may use this to contact your office. Email - The main contact email address of your location. Henry Schein One may use this to contact your office. Website - The website address of your location. NEA facility ID - There may be cases when you need to know your NEA facility ID. It appears here for your reference. Preferred fee schedule - The fee schedule that you prefer to use at your location. Note: By default, the location's default fee schedule (the fee schedule that was created by the system automatically for the location) is selected. It is recommended that you use the default selection because maintaining fees for the location's fee schedules and procedure codes will be simpler due to the fact that updating a fee for a procedure code in the location's default fee schedule affects the fee for the same procedure code on the location's Procedure Codes page and vice versa. Local tax - The amount of tax that is to be charged (for example, 6.50%) if your state requires sales tax to be charged for all products and services you offer. Currently, this is for reference only. Track appointment tasks and require reasons for incomplete tasks - When completing an appointment, you can have Dentrix Ascend remind you to complete all appointment tasks and specify a reason for not completing all appointment tasks if you do not complete them all. To turn on appointment workflow compliance set the switch to Yes. To turn off this feature, set the switch to No. Changing this setting will not take effect until after you log out and log back in. Note: With this compliance reminder feature turned on, when you complete appointments, Schedule Appointment messages no longer appear to remind you to schedule a patient's next recare appointment if that appointment has not been scheduled yet. With this compliance feature turned off, when you complete appointments, Schedule Appointment messages appear as applicable, and Update Patient Recare messages appear if a patient does not have the scheduled recare attached to his or her patient record. Local timezone - The time zone in which your office is located. Organization Information - For your reference, the name, customer ID, login ID, and address of your organization appear. 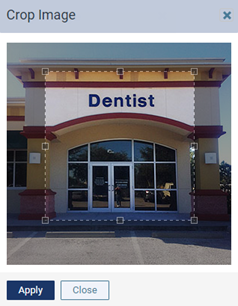 Users can use the Customer ID or Organization Login to log in to Dentrix Ascend. You cannot change the Customer ID; Henry Schein One assigns it to your organization. You can change the Organization Login from your website profile setup. 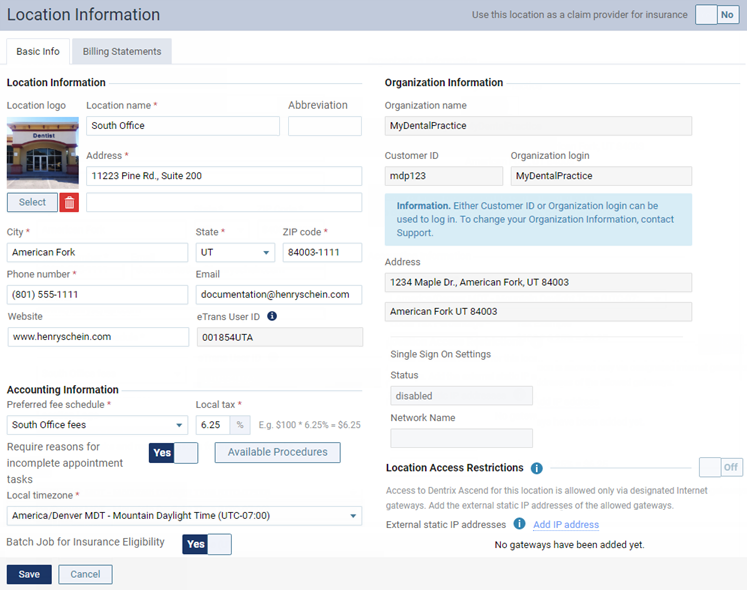 Claim Provider - You can set up your location or its corresponding business entity (such as a corporation) to be the billing provider on claims that are submitted for procedures performed at that location. This tab is available only if the Use this location as a claim provider for insurance switch is set to Yes. Location Access Restrictions - To allow access to this location only through designated internet gateways, after you add the necessary External static IP addresses, set the switch to On. To allow access to this location from anywhere, set the the switch to Off. On the Billing Statements tab, specify an Alternate Billing Address and the Defaults for Adding Statements to Patient Connection.